Read pricing, features, and a review for the Lorex 4MP HD Camera Home Security System (2KMPX44). The Lorex 4MP HD Camera Home Security System is a security system from Lorex. It boasts a night vision range of up to 130 ft. and a 1TB hard drive. 4K DVR can support up to 8 cameras. 4 Super HD 4MP security cameras. Pros: Feed quality is consistent even in bad weather. Cons: Some customers have complained that color night vision does not work in total darkness. Bottomline: An excellent security system with a great support team. What are some alternatives to the Lorex 4MP HD Camera Home Security System? 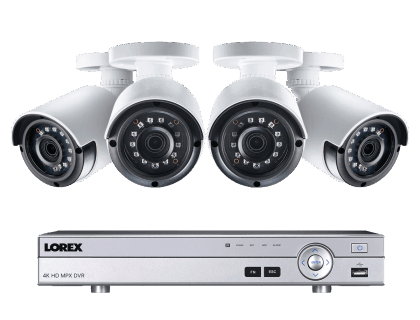 Where can I buy the Lorex 4MP HD Camera Home Security System? The Lorex 4MP HD Camera Home Security System is available on Amazon and on the Lorex website. Does the Lorex 4MP HD Camera Home Security System work at night? Yes, the camera has a maximum range of up to 130 ft. at night. Can the Lorex 4MP HD Camera Home Security System be used in any weather?